The City Men sit in the driving seat for a top two finish as they are four points clear of Henley so the outcome on Saturday at the Marine Travel Ground could have a serious impact on the race for second place. Tonbridge Juddians (4th) will have an eye on proceedings in Kent, but they must continue their outstanding form against Taunton Titans if they are to stay in the hunt. Watching from above are Rams RFC and the dominant league leaders can move closer to the title when they visit Worthing Raiders on Saturday. Whilst the spotlight is focusing on the play-off situation, the fight to avoid relegation is also under the microscope in Round 26. Guernsey and London Irish Wild Geese meet at Hazelwood with both sides desperate for the win to keep their faint survival hopes alive. Rivals Birmingham and Solihull will also be keen for a victory this weekend when they host Old Albanian while elsewhere, Redruth entertain Barnes, Bury St Edmunds visit Clifton and Old Redcliffians face Dings Crusaders in a tasty Bristol derby. Fourteen points. That is the minimum required for Rams RFC to seal the National Two South title between now and the end of the season. Seb Reynolds’ side have been relentless all term and 23 wins from their 25 matches has kept them in complete control of the title race for some time. They showed their class and quality last time out against Taunton Titans as they scored six tries to stay 12 points clear at the summit. The Berkshire club can take another step towards National One on Saturday when they travel to Worthing Raiders, who are desperate for an upturn in results. Jody Levett’s side enter Round 26 on a winless run of eight matches, but with a gap of 13 points separating the Raiders and the drop zone, the men from Roundstone Lane should be safe from relegation. Nevertheless, they will be itching to stop the rot this weekend and although it will be a tough ask to defeat Rams RFC on Saturday, their first victory since January 5th would be most welcome for Worthing. Canterbury skipper Sean Stapleton told us this week that his side cannot look past their upcoming fixture against Henley Hawks and it is hard to disagree with the former Connacht man. The City Men currently occupy second place as things stand and they take on their closest rivals for the play-off spot on Saturday afternoon. Andy Pratt’s men are four points clear of the Hawks and this is arguably their biggest hurdle between now and the end of the campaign so if they were to maintain their 100 per cent home record, then it would be a significant step towards a top two finish. The race for the play-off spot in #Nat2s is well and truly on and this weekend could provide the most significant moment to date. The hosts are also on a seven-match unbeaten run, but so are Henley. Since their slow start to 2019, Nigel Dudding’s side are once again firing on all cylinders and they know if they can get the better of Canterbury this weekend, they would move into the play-off spot with four games to go. The Hawks lost the reverse fixture 32-29 back in November so revenge would taste that little bit sweeter on Saturday afternoon. 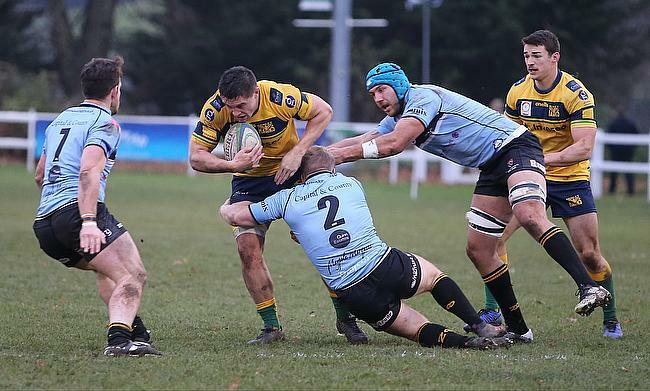 If Tonbridge Juddians had to choose an outcome from the fixture between Canterbury and Henley Hawks, it most likely would be a draw. Peter Dankert’s side are still in the race for a top two finish thanks to a remarkable run of form which has seen them lose to just once in the last 17 games. The Kent outfit are fourth in the table and seven points behind Canterbury, but if they are to remain in the play-off hunt, they must get their own job done against Taunton Titans in Round 26. That is easier said than done. For a while, Taunton were well in the promotion fight alongside TJs, but successive away defeats against Rams RFC and Henley means they are now 14 points off Canterbury with five matches left in the season. It looks as though Tony Yapp’s side will miss out on a top two finish once again, however, if they can extend their winning sequence at home to eight matches and the Canterbury/Henley result works in their favour, then Taunton may have an outside chance of sneaking into second place. Last time out, Redruth picked up their first away win since November and unsurprisingly, their success on the road delighted Director of Rugby Nigel Hambly. Their victory over Bury St Edmunds in Round 25 saw the Reds move into sixth place and they can further cement that position this weekend if they are able to maintain their excellent, recent home form. Following Hambly’s arrival at the start of 2019, Redruth have won all four of their games at the Recreation Ground and they will be favourites to add to that tally when they host Barnes on Saturday. The visitors come into this encounter with a slight spring in their step after two welcome and impressive home victories. Wins over Dings Crusaders and Worthing Raiders have eased any fears of a relegation battle for Joe Gray’s side as Barnes now sit 13 points clear of safety with five games remaining. Realistically, one more victory could be enough for the London-based side to book their place in this division for another season and considering they earnt promotion last year, staying in National Two South would signify an excellent campaign for Barnes. With five games to go, Birmingham and Solihull still have a fighting chance when it comes to avoiding relegation from National Two South. As things stand, Pete Glackin’s men sit nine points from safety and they must be targeting their remaining home fixtures in a bid to stay in this division. Three of their last five games come at Portway and the Bees are currently on a five-match unbeaten run on their own patch. Escaping the drop won’t be easy from this position for the Midlands club, but they can really enhance their survival hopes if they can continue their encouraging home form this weekend. Old Albanian are their visitors and the Hertfordshire club come into this clash having recaptured some form under James Buckland. Back to back home wins, including an excellent performance last time out against Clifton, has kept the OAs in the hunt for a top six finish and first away triumph since November would boost morale further at Woollams. Bury St Edmunds have spent their week off planning for next season. The Wolfpack are keen to push up the division and they have re-signed eight of their current players as Nick Wakley and his team look to build towards the 2019/20 campaign. In the short term, a sixth-place finish will be Bury’s goal and this weekend they travel to Clifton. Bury did lose to Redruth last time out, while the hosts on Saturday will also be looking to respond in Round 26. Clifton were beaten heavily by Old Albanian, but they were reduced to 14-men in the early stages of that game following a red-card to Niall Gibbons so Matt Salter and his side will be aiming for a positive reaction at Station Road. Like Bury, Clifton will be targeting a top six finish and a first home win since January would get their end of season aspirations back on track. Like with any derby game, every team will want to earn the bragging rights but for Old Redcliffians and Dings Crusaders, a victory would mean slightly more this time around. In terms of the visitors, Old Reds did lose the reverse clash with Dings back in November, but their recent form may be seen as a more pressing matter for Saul Nelson’s side. After a sparkling Christmas period, the men from Scotland Lane have actually won just one of their last five matches so a victory at Shaftesbury Park this weekend would be a welcome shot in the arm. Old Reds are also yet to win a ‘Bristol derby’ this term after the Crusaders defeated them 32-12 earlier in the campaign and the hosts on Saturday will be itching for the same outcome in Round 26. Dings are currently nine points clear of the drop zone and one win in seven games means they are not safe just yet, however, another derby success would move them a step closer to securing their spot in National Two South for a second year. What more can you say about this contest. It is win or bust for both London Irish Wild Geese and Guernsey as the two relegation rivals meet at Hazelwood this weekend. The visitors come into this game 14 points from safety and Jordan Reynolds’ side have given themselves a glimmer of hope after securing a win against Old Redcliffians last time out. The Raiders still have a mountain to climb to avoid an immediate relegation, but so do the Wild Geese. Eddie Fraher’s side are 15 points adrift of safety and just one win from their last seven games means they also face a tough task to stay in this league. However, Wild Geese have won four of their six matches at Hazelwood this term and if they can add to that total this weekend, it could give them a fighting chance.